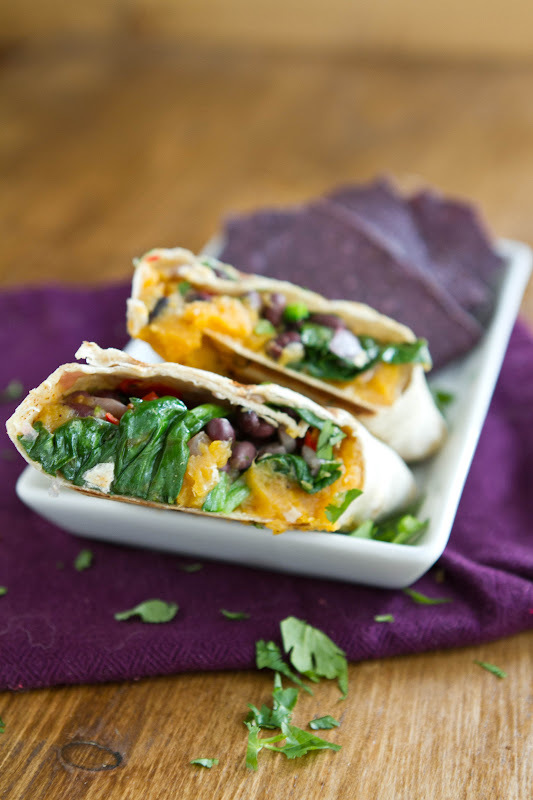 Sweet Potato and Spinach Burrito | Naturally. I think there is a notion that produce grown with pesticides means that the produce is bigger and more “perfect” looking. 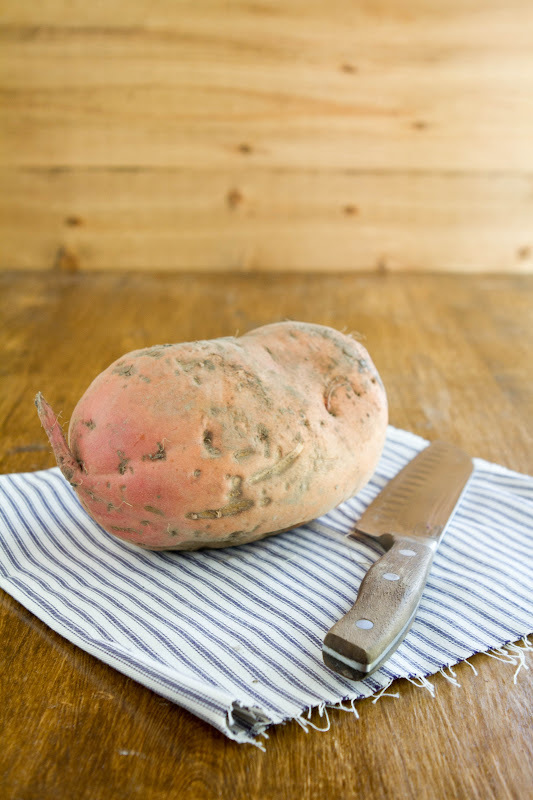 I would like you to take this sweet potato as evidence against that notion. I watched this sweet potato get dug up and this guy was actually on the smaller side. 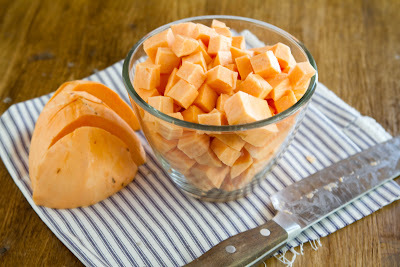 If you can’t tell, this sweet potato equaled about 9 cups diced. There are so many uses for sweet potatoes. You can use them in place of the squash for mac and cheese, ravioli, or even risotto. In this case, you can make an awesome vegan burrito that is chocked full of nutrients. I love chipotle and sweet potato together. 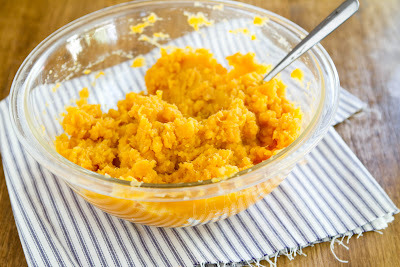 Make sweet potato puree and mix in chipotle powder. Taste and adjust the chipotle seasoning- use cautiously, it can be hot! Set aside. To finish the burrito I use my panini press pan. Place 1/2 the sweet potato mixture in the center of the tortilla and add a few spoonfuls of the spinach/black mixture on top. Roll and place the seem side down on the heated-up press. Heat for 1-2 minutes, flip, and heat until both sides have slightly browned. Lovely colours and such an original dish! I love to cook with sweet potato, but haven’t tried it in a burrito. yet! Nom-nom-nom. Very tasty! Thanks for sharing! 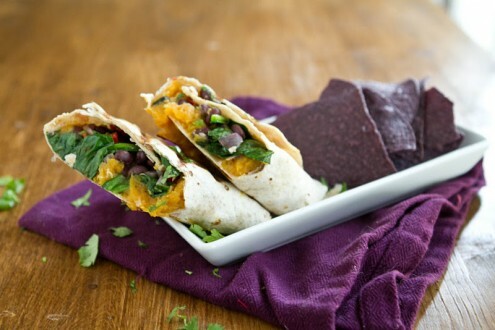 Sweet potato and black beans is seriously one of the best combos ever. I could eat one of these every day! Your recipes are every bit as delicious as they look. Just did this one today and it was a winner! I’ve been a long time lurker on your blog. Finally tried a recipe, the sweet potato and spinach burrito. Loved it! Simple, delicious and FILLING. Thanks, Ella for yet another wonderful recipe. Just found this site. LOVE the recipes! Thanks!